For more than 150 years, the nation has turned to the National Academies of Sciences, Engineering, and Medicine for independent, objective advice on issues that affect people's lives worldwide. 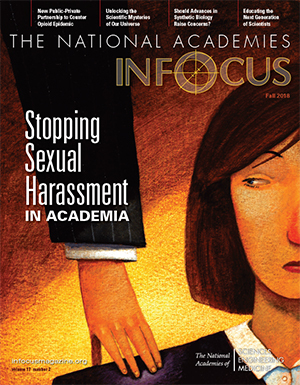 The National Academies In Focus features broad coverage of the Academies' activities. In Focus (ISSN 1534-8334) is published by the National Academies. Subscription (three issues): $10; Canada and foreign, $12 (U.S. currency only). Subscription address: In Focus, P.O. Box 8009, Aston, PA 19014. U.S. postage is paid at Washington, D.C. Back issues and back volumes can be ordered in microform from National Archive Publishing Company, 300 North Zeeb Road, Ann Arbor, MI 48103.